The purse was an excellent addition to symbolize the retirement of a great heart surgeon. I absolutely adored this purse. It has a really cool concave shape that makes it easy to carry w/o the chain. It has some signs of wear i.e. missing stones, but they are barely noticeable. The purse was much smaller than I expected. I could only manage to fit my id, credit card, a little cash, and a lip gloss. That being said I would love to own this purse, because it is so cute. So it was a bit smaller than I expected, it holds a lipstick and a pair of those fold up shoes and that's about it. It was gorgeous! The color was a beautiful red as shown and it sparkled with even a little bit of light and was a great contrast to my navy blue dress. I would probably not rent it again because of it's size but it was great to try once. i loved this bag! it is such a great accessory. it's a little small though - i had only packed a clinique almost lipstick and it barely fit. i'd plan to bring a normal sized lipstick next time. 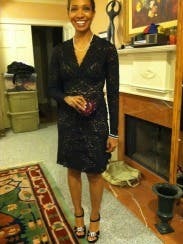 otherwise, it held the bare essentials just fine & added a great sparkle to my outfit.